1 What Is the Nutritional Value of Dates? Dates, produced mainly in the countries of Egypt, Saudi Arabia, Iran and Iraq, are a rich source of energy, fiber, vitamins and minerals. Compared to other dried fruits such as apricots and figs, dates are a good source of compounds with antioxidant activity. With the potential to protect cells against free radical damage, dates are indeed a "superfood." Dates have a high sugar content, making them a good source of calories. Although they do contain some protein and fat, the content of these nutrients is lower than other dried fruits. According to the USDA National Nutrient Database, three dried Medjool dates contain 199 calories and 47.86 grams of sugar. 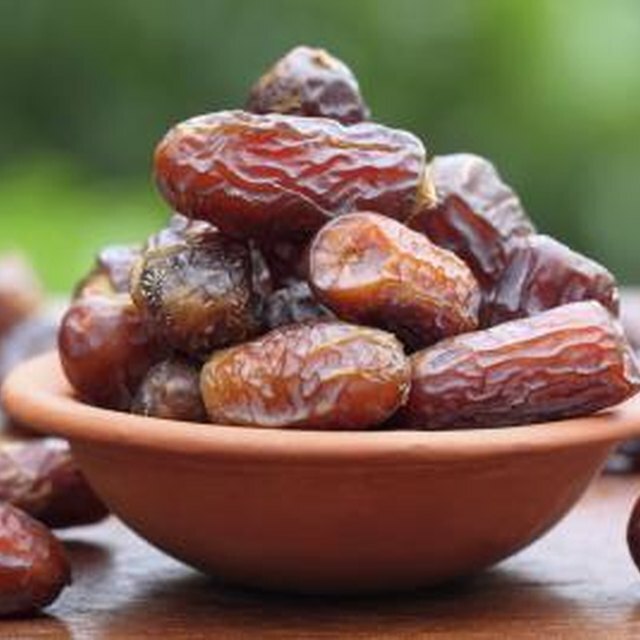 As dates contain highly concentrated energy, those monitoring their caloric intake must be conscious of portion size. Some of the carbohydrate found in dates is in the form of fiber, which does not contribute energy to the diet. According to the USDA National Nutrient Database, three dried Medjool dates contain 4.8 grams of fiber, fulfilling over 10 percent of the daily value of 25 to 38 grams. Fiber is essential in the diet to promote healthy digestion and prevent overeating. In addition, fiber helps to maintain heart health, and favorably affects blood cholesterol levels. According to "Critical Reviews in Food Science and Nutrition," 10 minerals have been reported in dates, with the most prominent being selenium, copper, potassium and magnesium, providing more than 15 percent of the recommended intake of these minerals in 100 grams of dates, which is roughly 4 dates. As dates have a high potassium and low sodium content, they are a healthy choice for those with hypertension. Dates also contain small amounts of vitamins B-complex and A, although the concentration of these vitamins is low compared to other dried fruits. Vitamin A acts as an antioxidant in the body, and dates are considered a reasonable source. Although there is a reduction in antioxidant content upon drying, dates are still considered a good source of antioxidants compared to other dried fruits. Several studies have reported the antioxidant content of dates and demonstrated the presence of compounds with free radical scavenging activity. Dates have been reported to have the second highest antioxidant values of fruits commonly consumed in China, although some variation exists between studies due to different techniques for measuring antioxidant content. What Are the Health Benefits of Raspberries and Blueberries?